The sacred mountain, Uritorco, guards the valley where we built the La Falda, Argentina labyrinth in the week of the Equinox this year. It is a lush valley, green and full of vegetation, trees unfamiliar to northern eyes and full of a small tumbleweed- like plant that arrives on the wind and adheres to telephone lines and branches. The sky is delicately lit by the receding sun of this time of year– very blue and at night clear and full of the Southern stars. Fourteen of us – Veriditas board members, friends and spouses, our designer John and his labyrinth painting partner — have left our usual lives to become workers for a week – to lay pavers in the sand, to design the patterns of the path, and to level it all. A professional mason will come along after our work and cement it all in place. 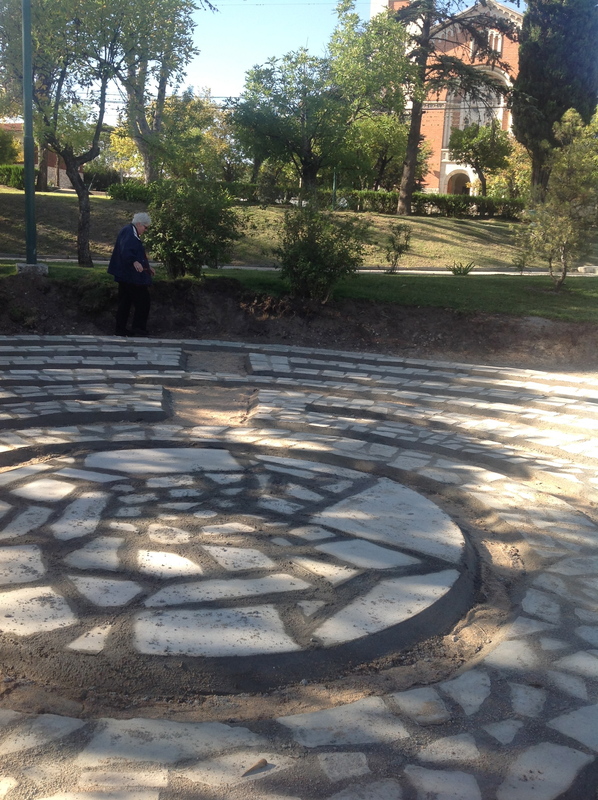 This is a legacy labyrinth, funded by a foundation associated with the Alla Arriba Retreat Center in La Falda in cooperation with the local municipality. We have been given a large area of the town square to create this camino of meditation and peace. We all came with sense of mission. Chris Katzenmeyer, Veriditas Board member and project manager, followed her intuition to the idea of a Legacy Labyrinth- built by those of us closely associated with the labyrinth and continued to follow her excitement when the request for such a labyrinth came from Argentina. The beauty of her vision lighted the way for us all. Some of us had been captivated by the idea that this town had once had its share of Nazi refugees seeking the new world after WWII. We hoped that our labyrinth would be useful in helping people come together, reconciling old hatreds, bringing healing. Others of us were excited to bring the labyrinth to South America. We all sensed a new direction for Veriditas. This would be a project of service and new people would learn to use our beloved path. What we accomplished in our week of work was manifold. Certainly we created a stunning labyrinth that radiates peace and love. We worked hard and were observed by hundreds of townsfolk over the course of the week. They were moved by our efforts and showed up at the inauguration curious and grateful. And other things happened:. We created community among ourselves. Many of us have know each other for years and have worked in producing programs in the states and in Chartres where we connect with our minds and spirits. Here we worked with our hands- everyone according to their ability. There were no slackers among us and seeing each other on the ground, carrying heavy stones, sandy, wet, sore brought us all to a very simple, humble and human state. Our hosts at Alla Arriba generously gifted us with experiences of music, Tango lessons and a temescal- a South American version of the Sweat Lodge. For me, this experience anchored our work in the indigenous world. As a sweat is designed to do, it installed in us the elements of earth, fire, water and air, taking us subliminally to the basis of our connection to Life. Singing songs from the local Mapuche people as well as songs in Lakota, Spanish and English, we were invited into a world without borders where our unvoiced longings could be sung into the womb of Pachamama, our Earth mother. I sensed the vast expanse of the South American continent less touched by the hand of Western Civilization—wild and free. In my imaginal world, I honed in on a place north west of where we were in the Southern Andes and sensed a call to explore there. This dream like experience beyond my reasonable mind has stayed with me and calls to me. It also installed a sense of the mystical Mother of all things in her Andean guise. She became present for me and it became clear that She wanted this labyrinth here is this heartland. In my spiritual life, I have explored many paths of heart. In my youth, I was captured by the Plains Indians’ stories and in years of wilderness exploration, grew to know the indigenous world in my bones. Since the early 1990’s my focus has been on my ancestral lands, pilgrimages to the celtic world. The labyrinth came into my mind and heart around this time and with it a path into the beauties of the mystical Christian story. I have always known the labyrinth to be an archetype of integration. It is my dependable companion on the journey to the land of the soul. But this trip has bought the labyrinth full circle into the realm of the four directions. As I walked into each quadrant on stones I had helped to lay, I sensed a weaving of the qualities of the North, South, East and West. In that inherently integrative experience, the labyrinth marks a portal into the mystery. It prepares us for a consciousness of wholeness that opens us to healing. I stood on the La Falda labyrinth on the Equinox. John, her designer, stood in the center. He stretched his arms out and the setting moon and rising sun landed in each palm, equidistant from the horizon. I sent my prayers northward to the Deer Heart Labyrinth in Petaluma, California, sensing the bridge between the North and South, strong and clear– praying for the connections between the continents to be equally strong and clear, imagining the bridge over the seas to the north and east, to Chartres and the thousands of bridges linking labyrinths the world over; the web of connections between these portals of integration and wholeness—the web of connections between us all. This entry was posted in Inspiration, Politics, Uncategorized on April 2, 2014 by Judith.